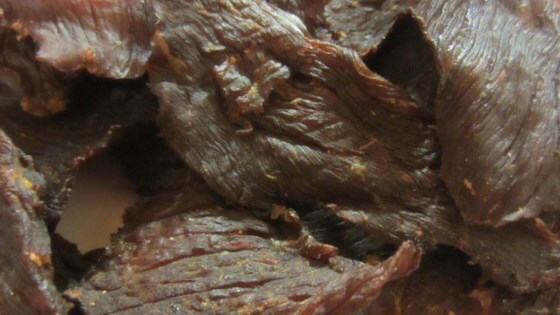 "This is a great way to make beef jerky at home without the use of a smoker or dehydrator. Just pop the meat in your oven and eight hours later you've got delicious jerky. Ask your butcher to slice the meat for you." In a medium, nonporous bowl, combine the salt, liquid smoke, garlic powder, monosodium glutamate, onion powder, soy sauce, Worcestershire sauce and ground black pepper to taste. Place meat slices in this mixture and coat well. Then place the meat slices onto two 10x15 inch baking dishes in a single layer. Bake at 200 degrees F (95 degrees C) for 8 hours. First time making beef jerky. This was excellent! Friends also loved this recipe. I reduced cooking time by 1 hour for more tender result. My husband thought the flavor of the jerky was very good, but thought it was too crunchy. I'll try it again and reduce the cooking time to give it the chewier texture that he likes. Very Good Jerky! I did marinate it overnight for extra flavor. Great Recipe! Beef jerky was great. I sent some to my husbands office and everyone there enjoyed it.